Move over processed deli- meats, there’s a new kind of sandwich in town! It’s colorful, mouth-watering, and totally satisfying! Whip out those canned beans and start roasting up those veggies, lunch just got a little brighter. 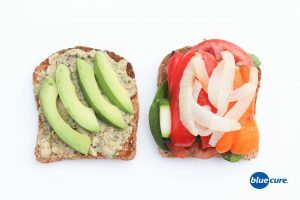 Note: Make a larger batch of veggies and then bean spread to have for leftovers to whip up for a quick lunch during a busy week. Preheat the oven to 400F. * Wash all the veggies. Slice the onions into rings. Cut the Zucchini into long strips, and the pepper into 4 large slices. Place a piece of parchment paper on a baking sheet and lay out the veggies. Roast in the oven for 20-30 minutes or until desired texture, just avoid burning. While the veggies are cooking, prepare the creamy basil bean spread. Either mash with a fork or add all ingredients to a food processor. Combine the beans, garlic powder, basil, nutritional yeast, lemon juice, and black pepper. Optional to add more basil and lemon juice. Slice the tomato and avocado. Toast the bread. Spread the creamy bean sauce onto the bread slices, add tomatoes, avocado slices, greens, and roasted veggies to each sandwich. Top with any additional spices, basil, crushed red pepper, or more nutritional yeast. Serve with roasted beet chips or fresh fruit. *If you prefer to grill the veggies, that is also a great option!